Rachel is graduate student from Welland, Ontario, Canada who completed her Honours B.Sc. in Earth Sciences with the co-op option at Brock University in St. Catharines, Ontario in 2014. Rachel's industry experience through the co-op program is with the Ontario Geological Survey, Trelawney Mining & Exploration Inc., IAMGOLD, and Kinross Gold Corp. She began her M.Sc. in Geology at the Mineral Deposit Research Unit in the University of British Columbia in 2016. As part of the surficial geochemical component of the CMIC Footprints Project's Porphyry Cu Subproject, she is evaluating exploration methodologies for buried porphyry copper deposits in glaciated and till-covered terrains. 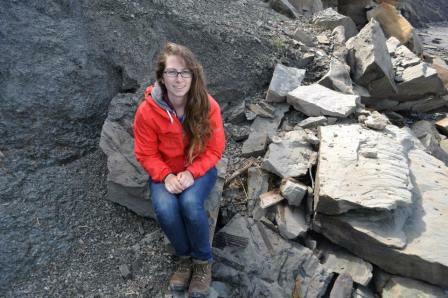 When she completes her Masters thesis at UBC, her goal is to have a career in exploration geology. She would love to continue working on copper porphyry projects in British Columbia in order to take advantage of her knowledge and training from her graduate studies. She hopes to focus on adapting to new technologies to save companies money and time while increasing exploration success rates. Her long-term career plan is to "retire" into environmental mine remediation after a career in mining and exploration. Rachel wishes to be able to use her knowledge of the mining industry and passion for nature to restore mine sites back to natural conditions. Rachel’s Masters project is part of the CMIC-NSERC ‘Footprints’ study’s Porphyry Cu Subproject which aims to identify and quantify the footprint of porphyry Cu(Mo) mineralization at Teck’s majority-owned Highland Valley Copper (HVC) operations in south-central British Columbia. Through a multi-disciplinary, collaborative and integrated approach, research aims to integrate various lithological, geophysical and surficial datasets to form a multi-dimensional model of the regional mineralization and alteration footprint. The deposits at HVC provide an ideal location to test new techniques and refine exploration methods to determine the spatial limit of ore-producing fluids in the bedrock and through overlying cover. Several known centres of porphyry Cu(Mo) mineralization remain buried and undeveloped at HVC. The two targets to be studied by the project are known as Highmont South and J.A. Bedrock mineralization at Highmont South sits under 2-10m of glacial cover. Surficial geochemical studies at this target will fully characterize mineralogical and chemical changes manifested in the surficial environment after glacial dispersal and soil development over mineralized bedrock. The evaluation of various exploration methods, including novel techniques, aims to develop future framework for surficial geochemical exploration of buried copper porphyry deposits in glaciated and till-covered terrains. These methods will be tested on the J.A. target, where bedrock mineralization is concealed by 150-350m of pre-glacial and glacial cover.